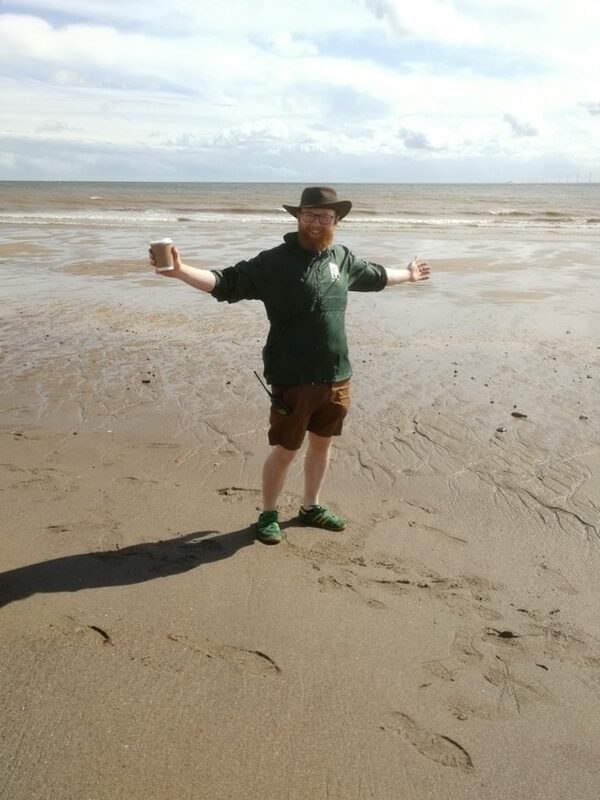 Living in the British Isles, we’re surrounded by the sea, the furthest you can be from a beach is only 70 miles. 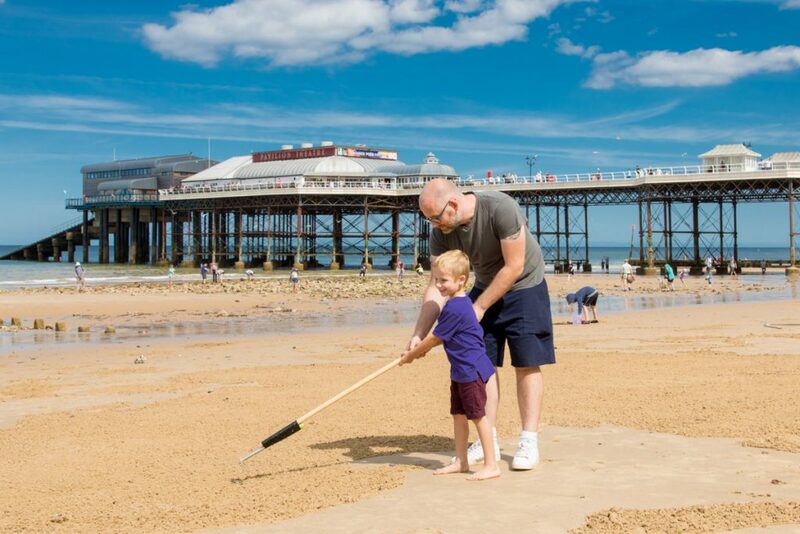 Whether you’re getting in the car with the family for a day building sandcastles and eating fish and chips or you surf, swim or sail in the coastal waters regularly; the North Sea, Irish Sea, English Channel and Atlantic Ocean hold a special place in our hearts. These seas are home to some incredible wildlife, including many species of whales, dolphins, and of course fish. 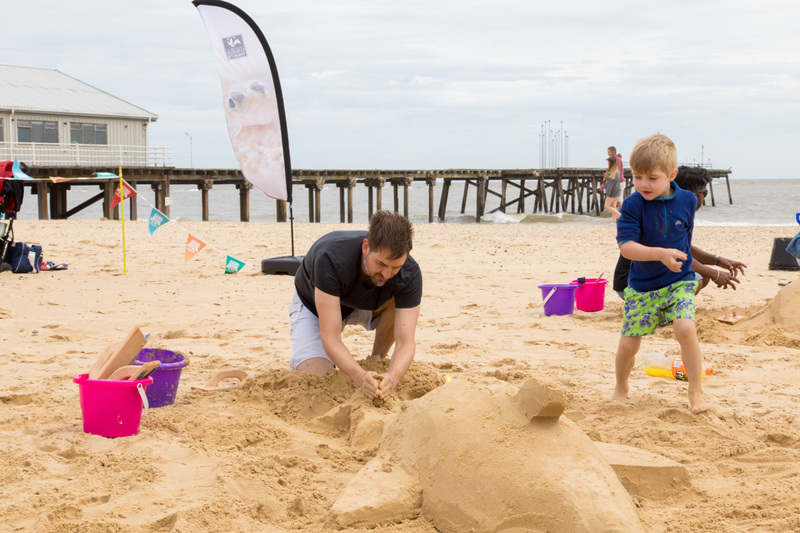 The Wildlife Trust are trying to increase awareness of this diversity and create a series of Marine Conservation Zones (MCZ) around the UK. These are areas of sea where rare or important features and wildlife communities are protected from damaging activities such as trawling. At the moment there are 50 MCZ in existence and the Wildlife Trust are proposing a further 41. 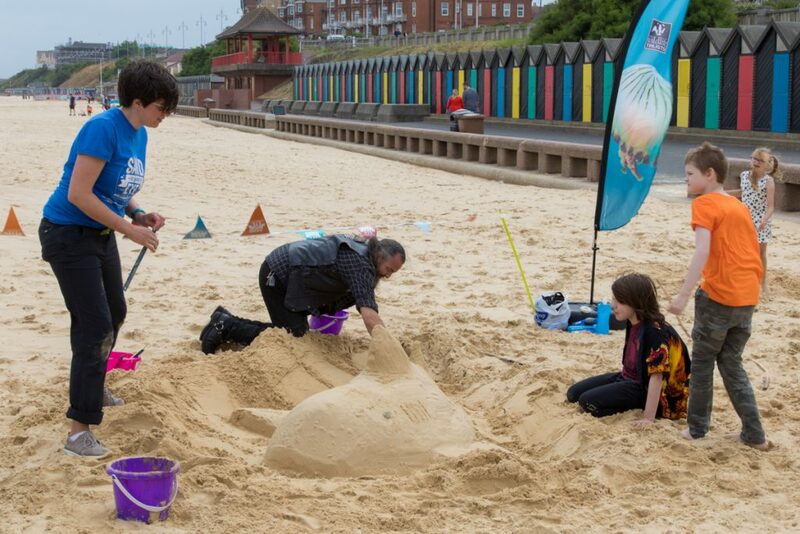 They need the British public’s support in persuading the government to help them protect our coastline and asked Sand In Your Eye to help promote their campaign. 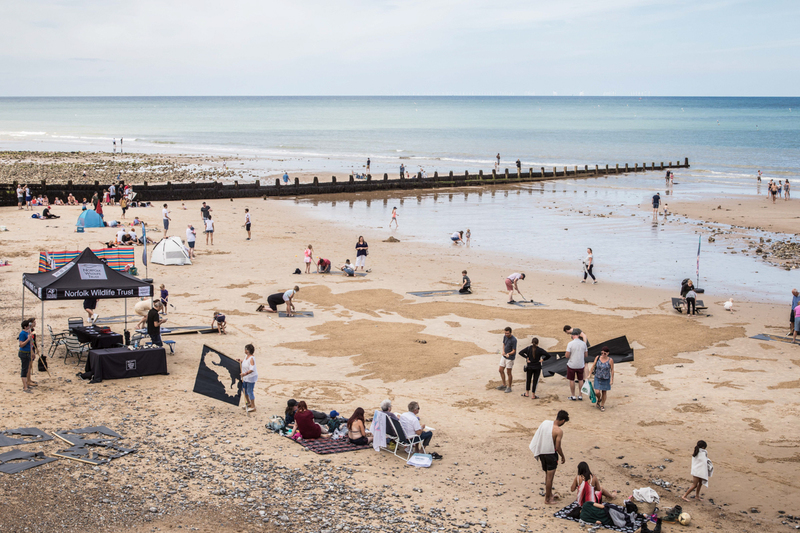 We kicked things off in Filey, Yorkshire with a 65 metre long beautiful anamorphic sand drawing of the British Isles, made by Rich Spence and Claire Jamieson. 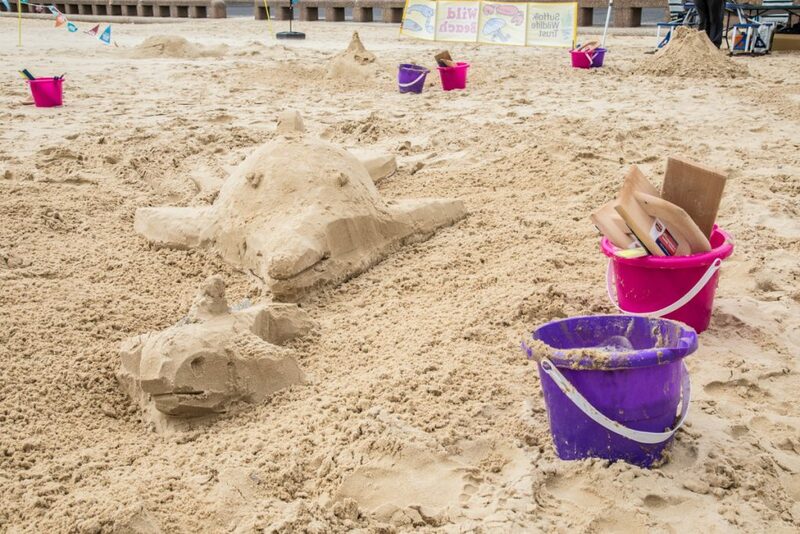 Filey – which is 2018’s beach of the year and deservedly so – is a great venue for sand art as passersby can view the sand drawing from the promenade. 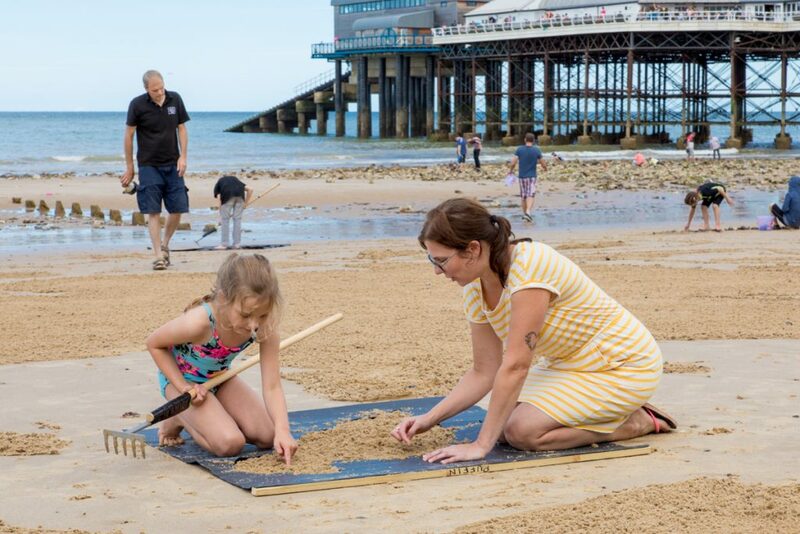 It was a perfect day, lovely and hot so the beach was very busy and we got lots of people taking part in our workshops, using stencils to make rake art crabs, basking sharks, bottlenose dolphins and sea horses. 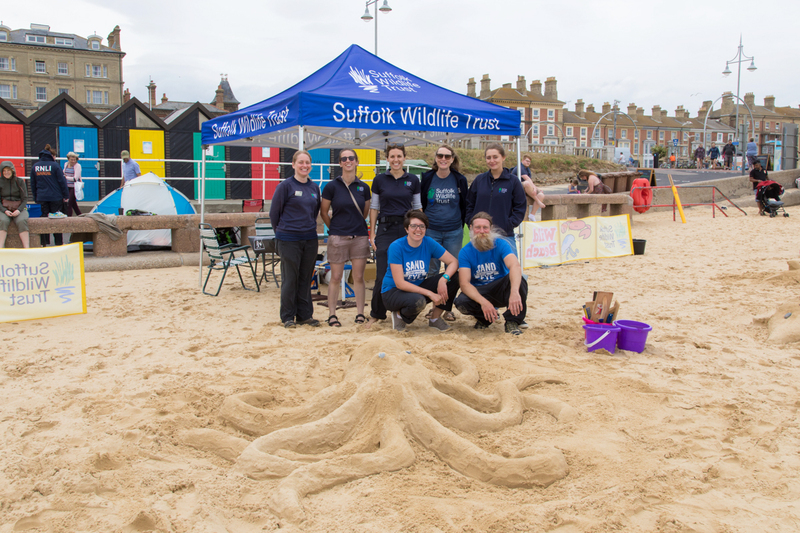 The Wildlife Trust were thrilled to get lots of signatures on their petition, they were also encouraging children to send postcards to Theresa May, urging her to protect their seas. We even had a fly past from a World War 2 bomber. 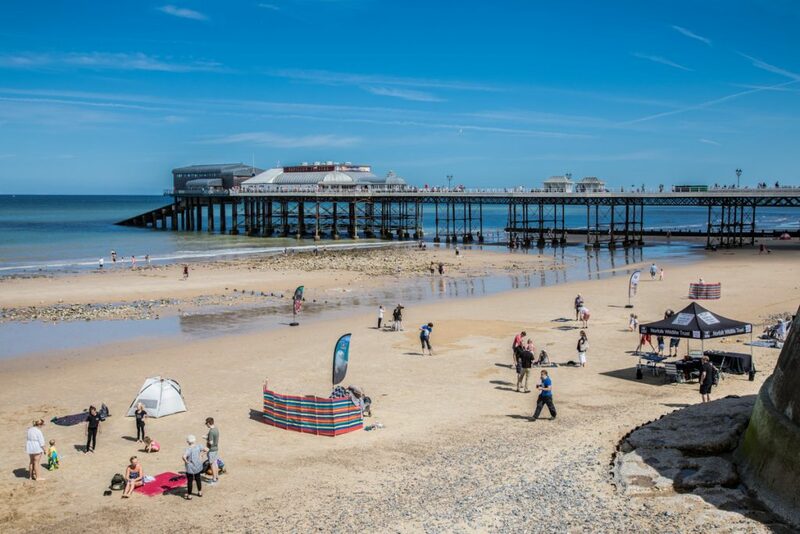 It was a lovely day, with great workshop participants and the Wildlife Trust were fantastic and delicious fish and chips, the only downside was that Rich got sunburnt and had a very red face. Tut tut Rich! have you never heard of sun screen?! 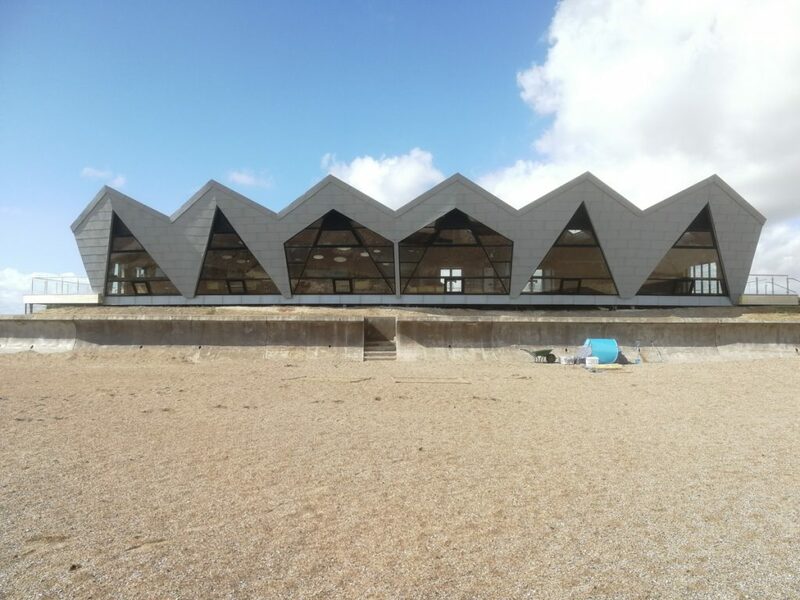 The next venue for the campaign was further down the east coast in Chapel St Leonards by the brand new North Sea Observatory. 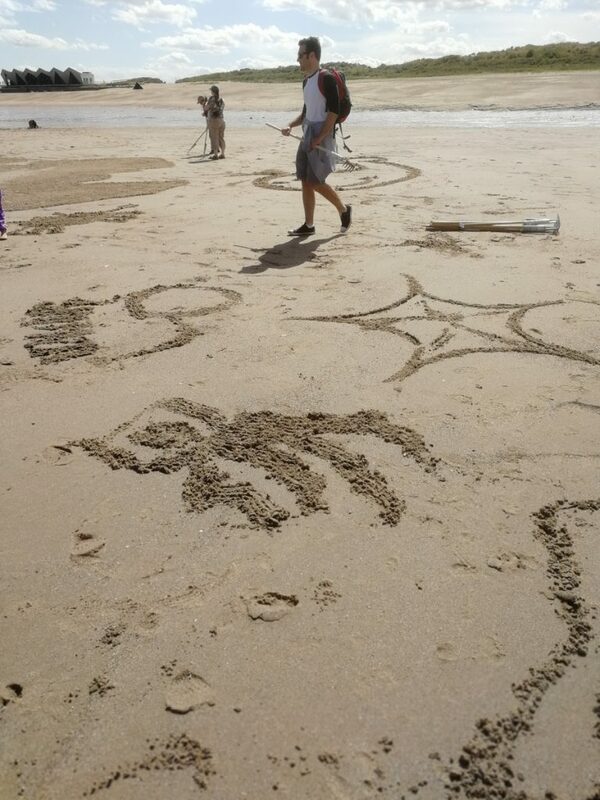 It was a slightly different story there with 40 mph gusts of winds, Rich and Jamie Wardley made a drawing on a slightly smaller scale of 35 metres long but making stencil sand drawings proved very difficult so we led some freestyle drawing workshops. 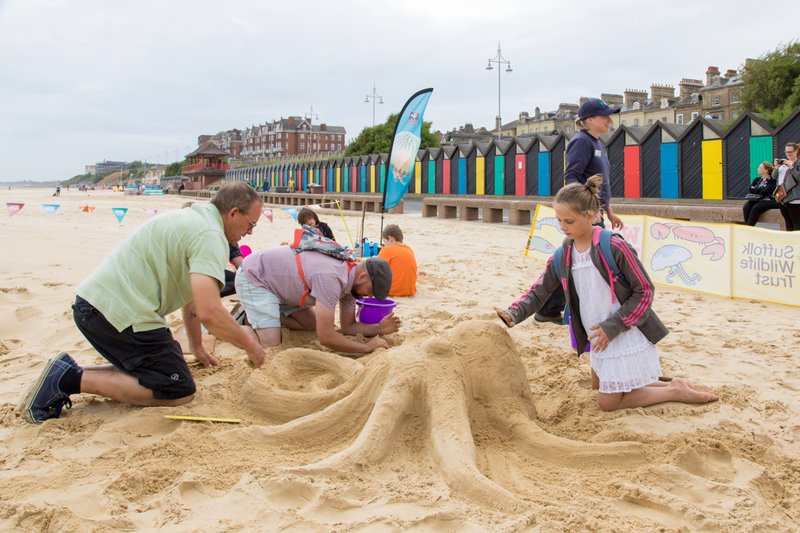 The beach goers really unlocked their imaginations and made sand drawings of some very creative sea urchins and HUGE octopuses. 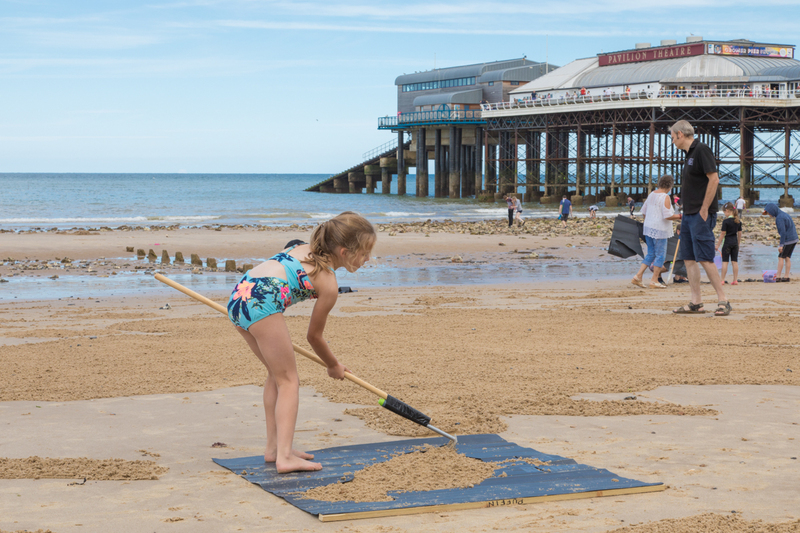 The weather followed us to Cromer in Norfolk a few weeks later with the sea battering the defenses and the wind breaking our tent, but we were able to use the stencils for the workshop this time round. 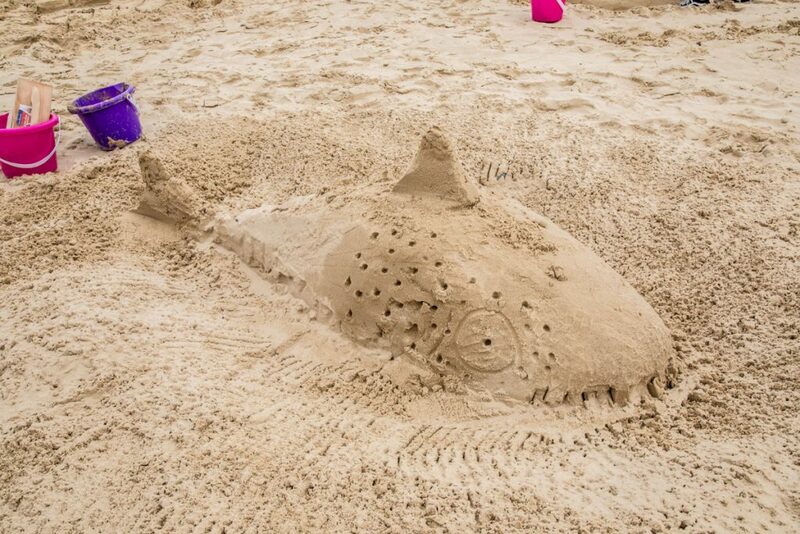 The workshop was so popular, the sand art stretched along the beach and spread all the way back to the pier. It was a great atmosphere that day, with really enthusiastic involvement from the Wildlife Trust staff and volunteers and all the visitors. 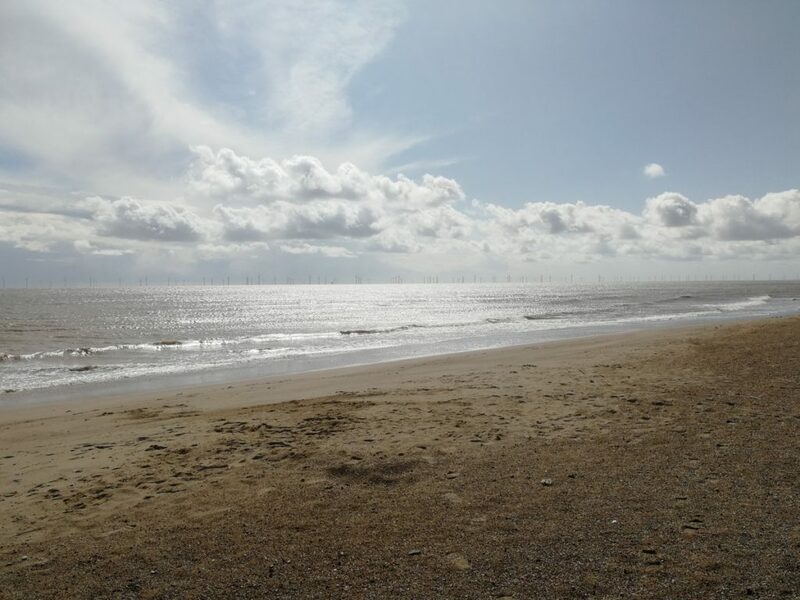 We made our final stop in Lowestoft. This beach was busy with some very brave early morning swimmers, a local football team and lots of runners. 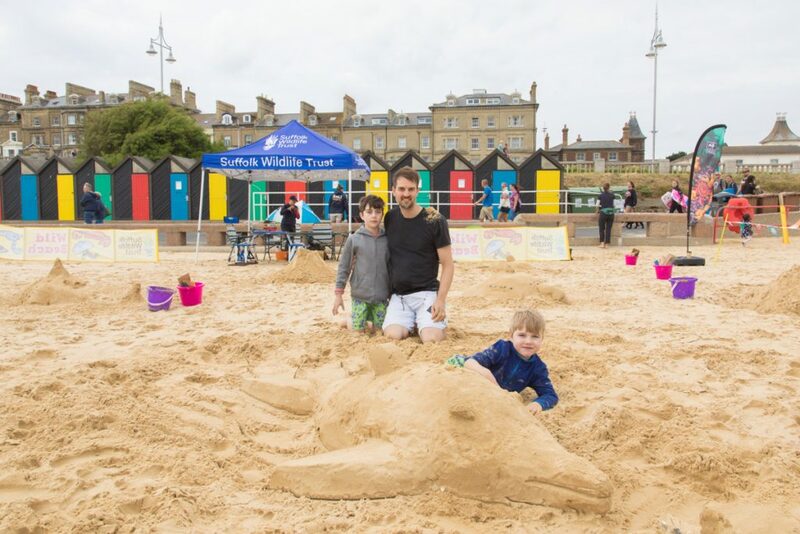 This time we held a drop in sand sculpture workshop, which was popular with both adults and children – in fact, one Dad had to be dragged away by his kids after 2 hours! A lot of time was spent fetching water for the sculpting as the wind and sun dried the sand really fast. Hats off to the Wildlife Trust staff and volunteers, they helped out massively and we couldn’t have done it without them. 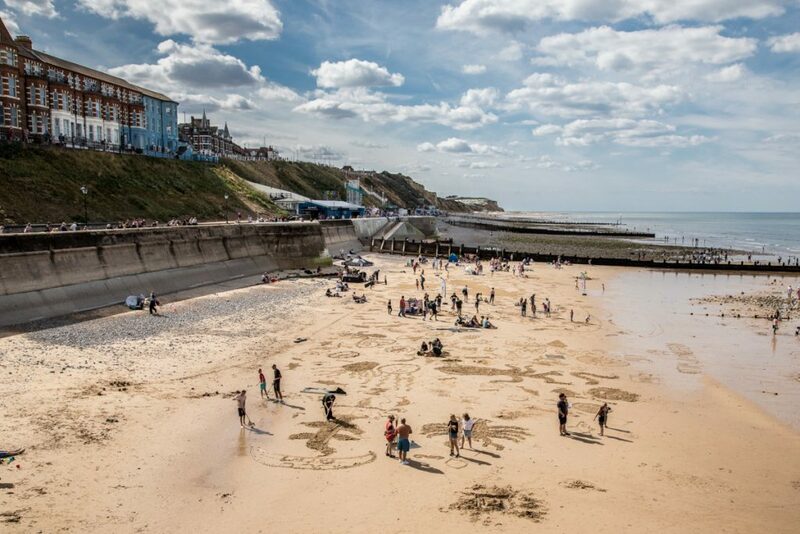 Once again the day ended with a massive portion of chips after a long day on the beach, but it was well worth the drive from Yorkshire to see so many people passionate and excited by a day on the coast. 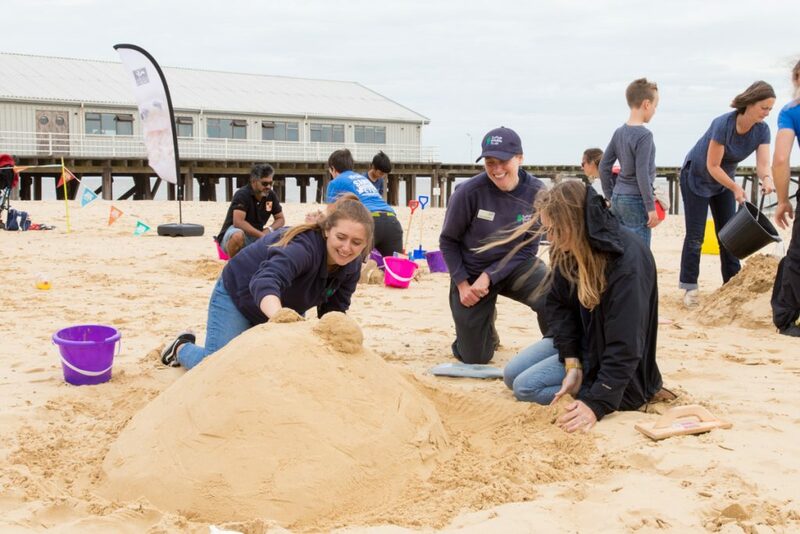 Thanks to Bex and Ana from the Wildlife Trust who organised everything, they and the other volunteers were fantastic and worked so hard. 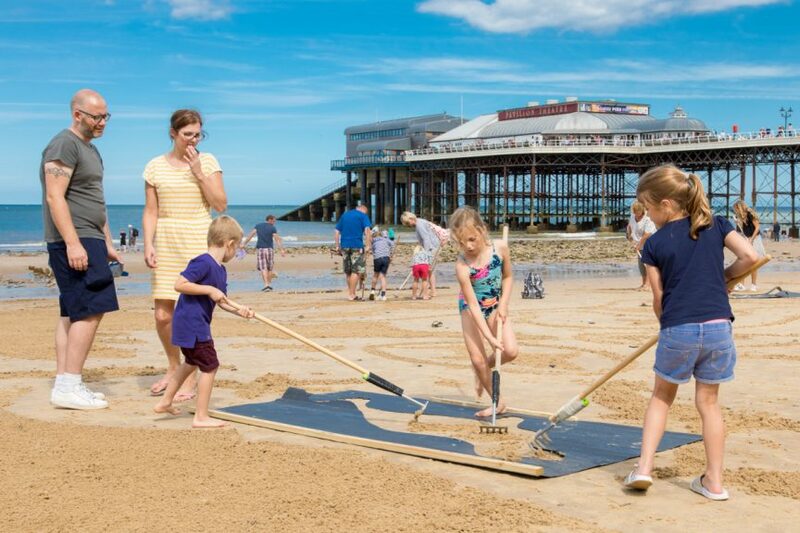 We really hope this series of anamorphic sand drawings and engagement workshops have helped the Wildlife Trust to raise awareness for the cause of Marine Conservation Zones, it’s something close to our hearts – after all, we do like to be beside the seaside!